WHAT IS DRIVER HEAD VOLUME AND HOW IS IT MEASURED? One of the more remarkable achievements in golf club design is the evolution in the size of the metal driver heads in the short time span they have been in existence. The early metal woods of the 1980s began to catch on because they were easier to hit because of their superior perimeter weighting, less labor-intensive to produce and were more durable than wood. In the late 1980s, the aerospace industry in Southern California was declining rapidly, and these companies, even a little company at the time named Callaway Golf, invested million of dollars in research and development of metal driver heads. By 1988, sales of metal woods surpassed those made of wood. 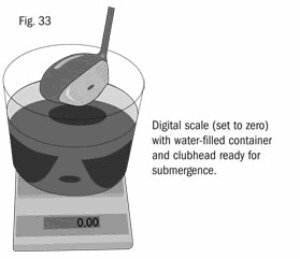 The volume of the clubhead must not exceed 460 cubic centimeters (28.06 cubic inches), plus a tolerance of 10 cubic centimeters (0.61 cubic inches). Simple EH! Dip the head in a beaker and measure how much it displaces. Bet you didn't think of that? Metal wood size was slightly smaller (150cc) to that of the wooden drivers (195cc) at the time. The volume remained relatively unchanged until 1991, when Mid-size metal woods came into existence. These “larger” sized heads where about the same size (185-190cc) as the wooden driver. A milestone of sorts came in Japan in 1990 as Mizuno created the first titanium driver called the Ti-110. Titanium had been well known for its high strength, yet lighter weight compared to steel. The extremely expensive price tag made this a very limited product to consumers. The use of titanium for golf clubs came from the technology used in the aerospace industry and the material of choice for driver heads due to the high strength-to-weight ratio. Titanium is lighter than stainless steel and allows the designer to manufacturer a much larger club head that meets the weight specifications of a normal driver. The strength of the material has increased durability for even the strongest golfers in the world. Driver heads produced from titanium didn’t become popularized until 1995 when the Callaway Great Big Bertha and the TaylorMade Titanium Bubble were introduced. These enormous sized heads were among the first heads to crack the 250cc barrier in volume. It took just 4 more years for Callaway and the rest of golf industry to make drivers that were 300cc.